One week ago, our administration assumed the enormous responsibilities that you, the American People, have placed in us. There is much work to do in the days ahead, but I wanted to give you an update on what we have accomplished already. In my first few days as your President, I’ve met with the leaders of some of our nation’s top manufacturing companies and labor unions. My message was clear: we want to make things in America, and we want to use American workers. Since my election, many companies have announced they are no longer moving jobs out of our country but are instead keeping and creating jobs right here in America. –An order to prepare for repealing and replacing Obamacare, it’s about time. –The withdrawal from the Trans-Pacific Partnership so that we can negotiate one-on-one deals that protect American workers. That would have been a disastrous deal for our workers. –An order to begin construction of the Keystone and Dakota Access pipelines, following a renegotiation of terms, with a requirement that pipelines installed in America be built with American steel and manufactured here. –A directive to expedite permits for new infrastructure and new manufacturing plants. –An order to immediately begin the border wall and to crack down on sanctuary cities. They are not safe, we have to take care of that horrible situation. This administration has hit the ground running at a record pace, everybody is talking about it. We are doing it with speed and we are doing it with intelligence and we will never, ever stop fighting on behalf of the American People. WASHINGTON, DC — This week, President Obama delivered his final weekly address thanking the American people for making him a better President and a better man. Over the past eight years, we have seen the goodness, resilience, and hope of the American people. We’ve seen what’s possible when we come together in the hard, but vital work of self-government – but we can’t take our democracy for granted. Our success as a Nation depends on our participation. It’s up to all of us to be guardians of our democracy, and to embrace the task of continually trying to improve our Nation. Despite our differences, we all share the same title: Citizen. And that is why President Obama looks forward to working by your side, as a citizen, for all of his remaining days. WASHINGTON, DC — In this week’s address, President Obama discussed his upcoming farewell address to the nation. In 1796, as George Washington set the precedent for a peaceful, democratic transfer of power, he also set a precedent by penning a farewell address to the American people. And over the 220 years since, many American presidents have followed his lead. Next week, the President will return to his hometown of Chicago to say a grateful farewell to the nation. This will mark the first time that a President has returned to his hometown to deliver such a speech. The President has said that the running thread through his career has been the notion that when ordinary people get involved, get engaged and come together, things change for the better. This belief is at the heart of the American experiment in self-government – and it gives purpose to new generations. Through his address, the President will thank his supporters, celebrate the ways we have changed this country for the better these past eight years, and offer his vision on where we all go from here. The President will deliver his farewell address at 9:00 PM EST on Tuesday, January 10, at McCormick Place in Chicago, Illinois. To tune in on Tuesday, visit WhiteHouse.gov/live. The running thread through my career has been the notion that when ordinary people get involved, get engaged, and come together in collective effort, things change for the better. That’s the belief at the heart of this precious American experiment in self-government. It’s what gives work and purpose to each new generation. Over the past eight years, we’ve added our own new chapter to that story. Together, we’ve turned an economy that was shrinking and losing jobs into one that’s growing and creating jobs, with poverty falling, incomes rising, and wages that have jumped faster over the past few years than at any time in the past four decades. Together, we’ve achieved what eluded politicians of both parties for a century – we’ve moved 20 million more Americans from uninsured to insured, ended the days of discrimination against the up to half of Americans who have a preexisting condition, and secured new rights and protections for everybody with health insurance. WASHINGTON, DC — In this week’s address, President Obama reflected on the significant progress we’ve made since he took office in 2009. Over the past eight years, we’ve turned the recession into recovery; 20 million more Americans have health insurance; we’ve brought 165,000 troops from Iraq and Afghanistan; we took out Osama bin Laden; and we brought nearly 200 nations together around a climate agreement that could save the planet for our kids. The President reminded us that this extraordinary progress wasn’t inevitable – it was the result of tough choices, and the hard work and resilience of the American people. It will take all of us working together to sustain and build on all that we’ve achieved – that’s how we keep America moving forward. The audio of the address and video of the address will be available online at http://www.whitehouse.gov at 6:00AM EDT, December 31, 2016. Happy New Year, everybody. At a time when we turn the page on one year and look ahead to the future, I just wanted to take a minute to thank you for everything you’ve done to make America stronger these past eight years. Just eight years ago, as I prepared to take office, our economy teetered on the brink of depression. Nearly 800,000 Americans were losing their jobs each month. In some communities, nearly one in five folks were out of work. Almost 180,000 troops were serving in Iraq and Afghanistan, and Osama bin Laden was still at large. And on challenges from health care to climate change, we’d been kicking the can down the road for way too long. Eight years later, you’ve told a different story. We’ve turned recession into recovery. Our businesses have created 15.6 million new jobs since early 2010 – and we’ve put more people back to work than all other major advanced economies combined. A resurgent auto industry has added nearly 700,000 jobs, and is producing more cars than ever. Poverty is falling. Incomes are rising. In fact, last year, folks’ typical household income rose by $2,800, that’s the single biggest increase on record, and folks at the bottom and middle saw bigger gains than those at the top. Twenty million more Americans know the financial security of health insurance. Our kids’ high school graduation rate is at an all-time high. We’ve brought 165,000 troops from Iraq and Afghanistan, and took out Osama bin Laden. Through diplomacy, we shut down Iran’s nuclear weapons program, opened up a new chapter with the people of Cuba, and brought nearly 200 nations together around a climate agreement that could save this planet for our kids. Almost every country on Earth sees America as stronger and more respected today than they did eight years ago. And marriage equality is finally a reality from coast to coast. We’ve made extraordinary progress as a country these past eight years. And here’s the thing: none of it was inevitable. It was the result of tough choices we made, and the result of your hard work and resilience. And to keep America moving forward is a task that falls to all of us. Sustaining and building on all we’ve achieved – from helping more young people afford a higher education, to ending discrimination based on preexisting conditions, to tightening rules on Wall Street, to protecting this planet for our kids – that’s going to take all of us working together. Because that’s always been our story – the story of ordinary people coming together in the hard, slow, sometimes frustrating, but always vital work of self-government. It’s been the privilege of my life to serve as your President. And as I prepare to take on the even more important role of citizen, know that I will be there with you every step of the way to ensure that this country forever strives to live up to the incredible promise of our founding – that all of us are created equal, and all of us deserve every chance to live out our dreams. And from the Obama family to yours – have a happy and blessed 2017. Hi, everybody. On behalf of the Obama family – Michelle, Malia, Sasha, Grandma, Bo, and Sunny – I want to wish you a very happy Thanksgiving. Like so many of you, we’ll spend the day with friends and family, turkey and touchdowns. We’ll give thanks for each other, and for all that God has given us. And we’ll reflect on what truly binds us as Americans. That’s never been more important. As a country, we’ve just emerged from a noisy, passionate, and sometimes divisive campaign season. After all, elections are often where we emphasize what sets us apart. We face off in a contest of “us” versus “them.” We focus on the candidate we support instead of some of the ideals we share. Today, we continue to give thanks for those blessings, and to all who ensured that they would be our inheritance. We remember the determined patriots who landed at the edge of the world in search of freedom. We give thanks to the brave men and women who defend that freedom in every corner of the world. And we honor all people – from the First Americans to our newest arrivals – who continue to shape our nation’s story, enrich our heritage, and give meaning to our founding values, values we must never take for granted. That in America, we are bound not by any one race or religion, but rather an adherence to a common belief – that all of us are created equal. That we may think, worship, and speak, and love as we please. That the gift of democracy is ours, and ours alone, to nurture and protect. Never doubt, that is what makes us American – not where we come from, what we look like, or what faith we practice, but the ideals to which we pledge our allegiance. It’s about our capacity to live up to the creed as old as our founding: “E Pluribus Unum” – that out of many, we are one. And as long as we continue to welcome the contributions of all people, as long as we stand up for each other, speak out for what is right, and stay true to these ideals – not just when it’s easy, but when it’s hard – then no one can ever take away our liberty. Our best days will always be ahead. And we will keep building a future where all of our children know the promise of America. Hi, everybody. As 2014 comes to an end, we can enter the New Year with new confidence that America is making significant strides where it counts. The steps we took nearly six years ago to rescue our economy and rebuild it on a new foundation helped make 2014 the strongest year for job growth since the 1990s. Over the past 57 months, our businesses have created nearly 11 million new jobs. And in a hopeful sign for middle-class families, wages are on the rise again. Our investments in American manufacturing have helped fuel its best stretch of job growth since the ‘90s. America is now the number one producer of oil and gas, saving drivers about 70 cents a gallon at the pump over last Christmas. The auto industry we rescued is on track for its strongest year since 2005. Thanks to the Affordable Care Act, about 10 million Americans have gained health insurance in the past year alone. And since I took office, we have cut our deficits by about two-thirds. Meanwhile, around the world, America is leading. We’re leading the coalition to degrade and ultimately destroy ISIL. We’re leading the global fight to combat the Ebola outbreak in West Africa. We’re leading global efforts to address climate change, including last month’s joint announcement with China. We’re turning a new page in our relationship with the Cuban people. And in less than two weeks, after more than 13 years, our combat mission in Afghanistan will be over, and our war there will come to a responsible end. Today, more of our troops are home for the holidays than at any time in over a decade. Still, many of our men and women in uniform will spend this Christmas in harm’s way. And as Commander-in-Chief, I want our troops to know: your country is united in our support and gratitude for you and your families. The six years since the financial crisis have demanded hard work and sacrifice on everyone’s part. But as a country, we have every right to be proud of what we’ve got to show for it. More jobs. More insured. A growing economy. Shrinking deficits. Bustling industry. Booming energy. Pick any metric you want – America’s resurgence is real. And we now have the chance to reverse the decades-long erosion of middle-class jobs and incomes. We just have to invest in the things that we know will secure even faster growth in higher-paying jobs for more Americans. We have to make sure our economy, our justice system, and our government work not only for a few, but for all of us. And I look forward to working together with the new Congress next year on these priorities. Sure, we’ll disagree on some things. We’ll have to compromise on others. I’ll act on my own when it’s necessary. But I will never stop trying to make life better for people like you. Because thanks to your efforts, a new foundation is laid. A new future is ready to be written. We have set the stage for a new American moment, and I’m going to spend every minute of my last two years making sure we seize it. On behalf of the Obama family, I wish all of you a very Merry Christmas. Thanks, and have a wonderful holiday season. Hi, everybody. It’s the holidays—a season to give thanks for our many blessings. The love of family. The joy of good friends. The bonds of community. The freedom we cherish as Americans. The peace and justice we seek in the world. That’s why, on Monday, I’ll be visiting our troops at Joint Base McGuire-Dix-Lakehurst in New Jersey—to salute them for their service and thank them for their sacrifices. Since our nation was attacked on 9/11, these men and women, like so many others in uniform, have met every mission we’ve asked of them. They deployed to Afghanistan and Iraq. In more than a decade of war, this 9/11 Generation has worked with the Afghan people to help them reclaim their communities and prevent terrorist attacks against our own country. Now, many of our troops are returning from Afghanistan, and on Monday, I’ll be proud to help welcome them home. That’s because, this month, our combat mission in Afghanistan will be over. Our war in Afghanistan is coming to a responsible end. Of course, the end of our combat mission in Afghanistan doesn’t mean the end of challenges to our security.We’ll continue to work with Afghans to make sure their country is stable and secure and is never again used to launch attacks against America. The troops I’ll visit on Monday have been part of our mission to degrade and ultimately destroy ISIL in Iraq and Syria. They’ve been supporting our efforts in West Africa to fight the Ebola epidemic and save lives. Because in times of crisis and challenge, the world turns to America for leadership. And when the world calls on America, we call on the brave men and women of our armed forces to do what no one else can. So this holiday season, as we give thanks for the blessings in our own lives, let’s also give thanks to our men and women in uniform who make those blessings possible. Even as some are coming home for the holidays, many more will be far from their families, who sacrifice along with them. There are so many ways we can express our gratitude to our troops, their families and our veterans—everyone can do something. To find out what you can do, just go to JoiningForces.gov. As a nation, as Americans, let’s always keep striving to serve them as well as they have always served us. Thanks, have a great weekend, and God bless our troops and their families. WASHINGTON, DC — In this week’s address, the President highlighted that six years after the Great Recession, thanks to the hard work of the American people and the President’s policies, our economy has come back further and faster than any other nation on Earth. With 10.3 million private sector jobs added over 55 straight months, America’s businesses have extended the longest streak of private-sector job gains on record. But even with this progress, too many Americans have yet to feel the benefits. The President reiterated the vision he set out earlier this week for steps that can lay a new foundation for stronger growth, rising wages, and expanded economic opportunity for middle class families. During the last decade, people thought the decline in American manufacturing was inevitable. But we chose to invest in American auto industry and American workers. And today, an auto industry that was flatlining six years ago is building and selling new cars at the fastest pace in eight years. American manufacturing is growing almost twice as fast as the rest of the economy, with new factories opening their doors at the fastest pace in decades. That’s progress we can be proud of. 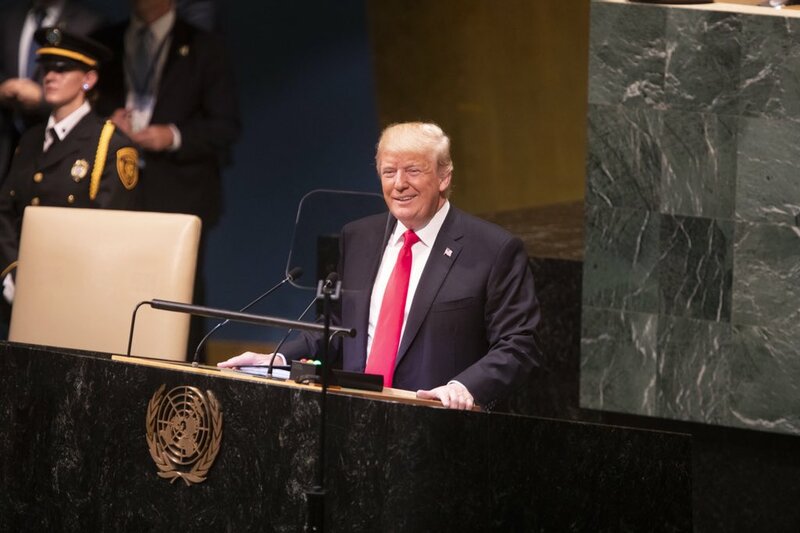 In this week’s address, the President reiterated the forceful and optimistic message of American leadership that he delivered in his speech before the United Nations General Assembly earlier this week. America is leading the world against the most pressing challenges, including the fight to degrade and destroy ISIL, the effort to stop the Ebola epidemic, and the movement to confront the threat from climate change. The world looks to America and its commitment to freedom in the face of uncertainly, and as the President said, it will continue to do so for generations to come. Hi, everybody. American leadership is the one constant in an uncertain world. That was true this week, as we mobilized the world to confront some of our most urgent challenges. America is leading the world in the fight to degrade and ultimately destroy the terrorist group known as ISIL. On Monday, our brave men and women in uniform began air strikes against ISIL targets in Syria. And they weren’t alone. I made it clear that America would act as part of a broad coalition, and we were joined in this action by friends and partners, including Arab nations. At the United Nations in New York, I worked to build more support for this coalition; to cut off terrorist financing; and to stop the flow of foreign fighters into and out of that region. And in my address to the UN, I challenged the world — especially Muslim communities – to reject the ideology of violent extremism, and to do more to tap the extraordinary potential of their young people. America is leading the effort to rally the world against Russian aggression in Ukraine. Along with our allies, we will support the people of Ukraine as they develop their democracy and economy. And this week, I called upon even more nations to join us on the right side of history. America is leading the fight to contain and combat the Ebola epidemic in West Africa. We’re deploying our doctors and scientists — supported by our military — to help corral the outbreak and pursue new treatments. From the United Kingdom and Germany to France and Senegal, other nations are stepping up their efforts, too, sending money, supplies, and personnel. And we will continue to rally other countries to join us in making concrete commitments to fight this disease, and enhance global health security for the long-term. America is engaging more partners and allies than ever to confront the growing threat of climate change before it’s too late. We’re doing our part, and helping developing nations do theirs. At home, we’ve invested in clean energy, cut carbon pollution, and created new jobs in the process. Abroad, our climate assistance now reaches more than 120 nations. And on Tuesday, I called on every nation – developed and developing alike — to join us in this effort for the sake of future generations. The people of the world look to us to lead. And we welcome that responsibility. We are heirs to a proud legacy of freedom. And as we showed the world this week, we are prepared to do what is necessary to secure that legacy for generations to come. WASHINGTON, DC — In this week’s address, the President reiterated his comprehensive and sustained counter-terrorism strategy to degrade and ultimately destroy the terrorist group ISIL. His plan brings together a campaign of targeted airstrikes, increased support for Iraqi and Kurdish forces already taking on terrorists, assistance from allies and partners, expanded efforts to train and equip the Syrian opposition, and ongoing humanitarian aid for those displaced by ISIL. The President expressed his immense appreciation for the military men and women who make these efforts possible, and reminded the world that America continues to lead and stand strong against terror. Hi, everybody. Our businesses have now added nearly 10 million new jobs over the past 52 months. The unemployment rate is at its lowest point since September 2008 – the fastest one-year drop in nearly 30 years. 401(k)s are growing, fewer homes are underwater, and for the first time in more than a decade, business leaders around the world have declared that the world’s number one place to invest isn’t China; it’s the United States of America – and our lead is growing. None of this is an accident. It’s thanks to the resilience and resolve of the American people that our country has recovered faster and come farther than almost any other advanced nation on Earth. But there’s another trend that threatens to undermine the progress you’ve helped make. Even as corporate profits are as high as ever, a small but growing group of big corporations are fleeing the country to get out of paying taxes. They’re keeping most of their business inside the United States, but they’re basically renouncing their citizenship and declaring that they’re based somewhere else, just to avoid paying their fair share. I want to be clear: this is only a few big corporations so far. The vast majority of American businesses pay their taxes right here in the United States. But when some companies cherrypick their taxes, it damages the country’s finances. It adds to the deficit. It makes it harder to invest in the things that will keep America strong, and it sticks you with the tab for what they stash offshore. Right now, a loophole in our tax laws makes this totally legal – and I think that’s totally wrong. You don’t get to pick which rules you play by, or which tax rate you pay, and neither should these companies. The best way to level the playing field is through tax reform that lowers the corporate tax rate, closes wasteful loopholes, and simplifies the tax code for everybody. But stopping companies from renouncing their citizenship just to get out of paying their fair share of taxes is something that cannot wait. That’s why, in my budget earlier this year, I proposed closing this unpatriotic tax loophole for good. Democrats in Congress have advanced proposals that would do the same thing. A couple Republicans have indicated they want to address this too, and I hope more join us. Rather than double-down on the top-down economics that let a fortunate few play by their own rules, let’s embrace an economic patriotism that says we rise or fall together, as one nation, and as one people. Let’s reward the hard work of ordinary Americans who play by the rules. Together, we can build up our middle class, hand down something better to our kids, and restore the American Dream for all who work for it and study for it and strive for it. WASHINGTON, DC — In this week’s address, the President recapped his visits with folks who have written him letters about their own American stories — their successes and struggles. While Congressional Republicans are blocking meaningful measures that would strengthen the middle class, the President continues looking for ways to grow the economy and expand opportunity for more hardworking Americans. The President again urged Congress to join him, as they were elected to do, in working on behalf of everyday Americans – including those the President spent time with this week – by investing in our infrastructure to support American jobs, and ensuring that the Highway Trust Fund does not expire. The audio of the address and video of the address will be available online at www.whitehouse.gov at 6:00 a.m. ET, July 12, 2014. Hi, everybody. This week, I spent some time in Colorado and Texas, talking with people about what’s going on in their lives. I ran for President to fight for Americans just like Elizabeth – people who work hard, do everything right, and just want a chance to build a decent life for themselves and their families. And after the worst economic crisis in generations, our businesses have now created nearly 10 million new jobs over the past 52 months. The unemployment rate has fallen to its lowest point since 2008. By almost every measure, our economy is better off than it was five years ago. But while we’ve created more jobs at this point of the year than any year since 1999, too many families barely earn what they did in 1999. It’s harder to pay for college, save, or retire, because people’s wages and incomes have not gone up. Nearly all the gains of the recovery are going to the very top – and aren’t making a difference in your lives. And I believe America does better when the middle class does better. And I’ve laid out an opportunity agenda to create jobs, train workers, educate our kids, and make sure hard work actually pays off. These are the things we should be doing to grow the middle class and help folks work their way into the middle class. And it’s pretty uncontroversial stuff. I hope we can work together on it. And I’m always willing to compromise if folks have other ideas or if it advances generally the interests of working Americans. But so far this year, Republicans in Congress have blocked every serious idea to strengthen the middle class. Lifting the minimum wage, fair pay, student loan reform – they’ve said no to all of it. And that’s when I’ve acted this year to help working Americans on my own– when Congress won’t act. I’ve taken actions to attract new jobs, lift workers’ wages, help students pay off their loans, and more. And the Republican plan right now is not to do some of this work with me – instead, it’s to sue me. That’s actually what they’re spending their time on. It’s a political stunt that’s going to waste months of America’s time. And by the way, they’re going to pay for it using your hard-earned tax dollars. I have a better idea: do something, Congress. Do anything to help working Americans. Join the rest of the country. Join me, I’m looking forward to working with you. You know, on Tuesday, I met with Carolyn Reed and her husband David, who own six Silver Mine Sub shops in Colorado. Two days later, they announced they’re giving their hourly employees a raise to ten dollars and ten cents an hour. Carolyn and Americans like her all across the country are happy to do their part. Congress now needs to step up and do its part. And next week, I’ll travel to a couple of job sites to talk about how Democrats and Republicans can work together to grow the economy and protect nearly 700,000 jobs by passing a highway bill by the end of the summer. I’m here because hardworking Americans like Elizabeth and Carolyn. That’s something I’ll never forget – it’s something I’ll never stop fighting for. Thanks, and have a great weekend. WASHINGTON, DC — In this week’s address, the President previewed Monday’s first-ever White House Summit on Working Families where he will bring together businesses leaders and workers to discuss the challenges that working parents face every day and lift up solutions that are good for these families and American businesses. Many working families can’t afford basic needs like childcare or receive simple benefits such as paid family leave that are common in most countries around the world. When hardworking Americans are forced to choose between work and family, America lags behind in a global economy. To stay competitive and economically successful, America needs to bring our workplace policies into the 21st century. In addition to the address, the White House is also releasing a new report by the Council of Economic Advisers that examines economic benefits that paid family leave policies can have for workers and employers. A copy of that report, which is also embargoed until 6:00 am EDT Saturday June 21st, can be found here. Hi, everybody. As President, my top priority is rebuilding an economy where everybody who works hard has the chance to get ahead. That’s what I’ll spend some time talking about on Monday, at the White House Summit on Working Families. We’re bringing together business leaders and workers to talk about the challenges that working parents face every day, and how we can address them together. Take paid family leave. Many jobs don’t offer adequate leave to care for a new baby or an ailing parent, so workers can’t afford to be there when their family needs them the most. That’s wrong. And it puts us way behind the times. Only three countries in the world report that they don’t offer paid maternity leave. Three. And the United States is one of them. It’s time to change that. A few states have acted on their own to give workers paid family leave, but this should be available to everyone, because all Americans should be able to afford to care for a family member in need. Childcare is another challenge. Most working families I know can’t afford thousands a year for childcare, but often that’s what it costs. That leaves parents scrambling just to make sure their kids are safe while they’re at work – forget about giving them the high-quality early childhood education that helps kids succeed in life. Then there’s the issue of flexibility – the ability to take a few hours off for a parent-teacher conference or to work from home when your kid is sick. Most workers want it, but not enough of them have it. What’s more, it not only makes workers happier – studies show that flexibility can make workers more productive and reduce worker turnover and absenteeism. That’s good for business. At a time when women make up about half of America’s workforce, outdated workplace policies that make it harder for mothers to work hold our entire economy back. But these aren’t just problems for women. Men also care about who’s watching their kids. They’re rearranging their schedules to make it to soccer games and school plays. Lots of sons help care for aging parents. And plenty of fathers would love to be home for their new baby’s first weeks in the world. In fact, in a new study, nearly half of all parents – women and men – report that they’ve said no to a job, not because they didn’t want it, but because it would be too hard on their families. When that many talented, hard-working people are forced to choose between work and family, something’s wrong. Other countries are making it easier for people to have both. We should too, if we want American businesses to compete and win in the global economy. Family leave. Childcare. Flexibility. These aren’t frills – they’re basic needs. They shouldn’t be bonuses – they should be the bottom line. The good news is, some businesses are embracing family-friendly policies, because they know it’s key to attracting and retaining talented employees. And I’m going to keep highlighting the businesses that do. Because I take this personally. I take it personally as the son and grandson of some strong women who worked hard to support my sister and me. As the husband of a brilliant woman who struggled to balance work and raising our young ladies when my job often kept me away. And as the father of two beautiful girls, whom I want to be there for as much as I possibly can – and whom I hope will be able to have families and careers of their own one day. We know from our history that our economy grows best from the middle-out; that our country does better when everybody participates; when everyone’s talents are put to use; when we all have a fair shot. That’s the America I believe in. That’s the America I’ll keep fighting for every day. Thanks, and have a great weekend. WASHINGTON, DC— In this week’s address, President Obama wished America’s dads a happy Father’s Day and underscored the crucial role fathers play in our society. The President encouraged Americans to support those living without a father figure through initiatives like My Brother’s Keeper. He also highlighted actions he is taking on behalf of hardworking, responsible dads and moms, such as hosting the first-ever White House Working Families Summit later this month, and called on Congress to do its part to help offer more parents the chance to work hard and provide for their families. Hi, everybody. Sunday is Father’s Day. If you haven’t got Dad a gift yet, there’s still time. Just barely. But the truth is, what we give our fathers can never match what our fathers give us. I know how important it is to have a dad in your life, because I grew up without my father around. I felt the weight of his absence. So for Michelle and our girls, I try every day to be the husband and father my family didn’t have when I was young. And every chance I get, I encourage fathers to get more involved in their children’s lives, because what makes you a man isn’t the ability to have a child – it’s the courage to raise one. Still, over the past couple years, I’ve met with a lot of young people who don’t have a father figure around. And while there’s nothing that can replace a parent, any of us can do our part to be a mentor, a sounding board, a role model for a kid who needs one. Earlier this year, I launched an initiative called My Brother’s Keeper – an all-hands-on-deck effort to help more of our young men reach their full potential. And if you want to be a mentor to a young man in your community, you can find out how at WhiteHouse.gov/MyBrothersKeeper. Now, when I launched this initiative, I said that government can’t play the primary role in a young person’s life. Taking responsibility for being a great parent or mentor is a choice that we, as individuals, have to make. No government program can ever take the place of a parent’s love. Still, as a country, there are ways we can help support dads and moms who make that choice. That’s why, earlier this week, we brought working dads from across America to the White House to talk about the challenges they face. And in a few weeks, I’ll hold the first-ever White House Working Families Summit. We’ve still got too many workplace policies that belong in the 1950s, and it’s time to bring them up to date for today’s families, where oftentimes, both parents are working. Moms and dads deserve affordable child care, and time off to care for a sick parent or child without running into hardship. Women deserve equal pay for equal work – and at a time when more women are breadwinners for a family, that benefits men, too. And because no parent who works full-time should have to raise a family in poverty, it’s time for Congress to follow the lead of state after state, get on the bandwagon, and give America a raise. Dads work hard. So our country should do what we can to make sure their hard work pays off; to make sure life for them and their families is a little less stressful, and a little more secure, so they can be the dads their kids need them to be. Because there’s nothing more precious in life than the time we spend with our children. There’s no better feeling than knowing that we can be there for them, and provide for them, and help give them every shot at success. Let’s make sure every dad who works hard and takes responsibility has the chance to know that feeling, not just on one Sunday, but every day of the year. Thanks everybody, happy Father’s Day, and have a great weekend. In this week’s address, First Lady Michelle Obama honored all mothers on this upcoming Mother’s Day and offered her thoughts, prayers and support in the wake of the unconscionable terrorist kidnapping of more than 200 Nigerian girls. 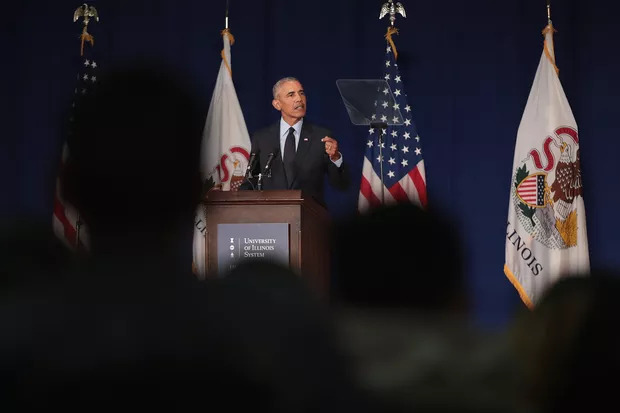 WASHINGTON, DC — In his weekly address, President Obama said he took action this week to launch new manufacturing hubs and expand a competition to fund transformative infrastructure projects. Both are policies aimed at expanding economic opportunity for all by creating jobs and ensuring the long-term strength of the American economy. Congress can boost this effort by passing a bipartisan proposal to create a nationwide network of high-tech manufacturing hubs and taking steps to invest in our nation’s infrastructure — rebuilding our transportation system, creating new construction jobs, and better connecting Americans to economic opportunities. Hi everybody. In my State of the Union Address, I said that the best measure of opportunity is access to a good job. And after the worst recession of our lifetimes, our businesses have created eight and a half million new jobs in the last four years. But we need to do more to make America a magnet for good jobs for the future. And in this year of action, where Congress won’t do that, I will do whatever I can to expand opportunity for more Americans. This week, I took two actions to attract new jobs to America – jobs in American manufacturing, and jobs rebuilding America’s infrastructure. Here’s why this is important. In the 2000s alone, we lost more than one-third of all American manufacturing jobs. One in three. And when the housing bubble burst, workers in the construction industry were hit harder than just about anybody. The good news is, today, our manufacturers have added more than 620,000 jobs over the last four years – the first sustained growth in manufacturing jobs since the 1990s. Still, the economy has changed. If we want to attract more good manufacturing jobs to America, we’ve got to make sure we’re on the cutting edge of new manufacturing technologies and techniques. And in today’s global economy, first-class jobs gravitate to first-class infrastructure. That’s why, on Tuesday, I launched two new high-tech manufacturing hubs – places where businesses and universities will partner to turn groundbreaking research into real-world goods Made in America. So far, we’ve launched four of these hubs, where our workers can master 3-D printing, energy-efficient electronics, lightweight metals, and digital manufacturing – all technologies that can help ensure a steady stream of good jobs well into the 21st century. Then on Wednesday, I launched a new competition to build 21st century infrastructure – roads and bridges, mass transit, more efficient ports, and faster passenger rail. Rebuilding America won’t just attract new businesses; it will create good construction jobs that can’t be shipped overseas. Of course, Congress could make an even bigger difference in both areas. Thanks to the leadership of a bipartisan group of lawmakers, there’s a bill in Congress right now that would create an entire network of high-tech manufacturing hubs all across the country. And next week, I’ll send Congress a budget that will rebuild our transportation systems and support millions of jobs nationwide. There’s a lot we can do if we work together. And while Congress decides what it’s going to do, I’m going to keep doing everything in my power to rebuild an economy where everyone who works hard has the chance to get ahead – where we’re restoring our founding vision of opportunity for all.